Cancer process breast tissue is widely distributed, so their preventive care plan included in the annual health screening of women older than forty years. For screening and diagnosis of pathology using ultrasound and a mammogram that can detect up to ninety percent of diseases. CT (computed tomography) of the breast is another method of examination, but in some cases it is impossible to establish an accurate diagnosis. CT is used for diagnosis of diseases of many organs and systems for over thirty years. The study is carried out using a special device – computed tomography. The method is based on the x-ray beam, which penetrates the study on the spiral, performs sequential scans with a frequency of a few millimeters. The result is recorded on x-ray film, in the form of transverse slices (tomograms). 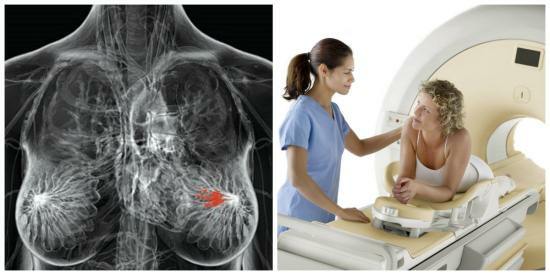 For the initial diagnosis of breast cancer CT scan is not used, there are routine methods — ultrasound and mammography. However, ultrasound is not always informative with a high content of fatty tissue in the breast, and mammography, by contrast, are technically challenging with a small amount glands. In this case, use of computer and magnetic resonance tomography. Use computer and magnetic resonance tomography for the diagnosis of tumors that do not fall within the zone of visibility during surgery, for example, due to the location at the base of the body close to the chest. Informative study and infiltrative forms of cancer, when the tumor is diffuse and affects the entire body. 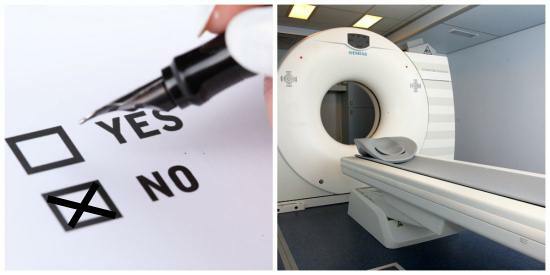 If the diagnosis of the tumor itself, the use of CT is not considered appropriate, in order to assess the stage of the cancer process, computer and magnetic resonance imaging techniques remain indispensable. They are used to estimate the prevalence of the tumor to the surrounding tissue (chest, regional lymph nodes), as well as to detect metastases in other organs: lungs, mediastinum, liver. This is necessary to properly determine the treatment strategy, since in case of significant spreading of the cancer beyond the organ surgical treatment is not indicated. Allows computed tomography to assess the quality of surgical intervention: radical surgery, no haematomas and abscesses in the field of surgical treatment. Use of CT, like MRI, to assess the effectiveness of chemotherapy and radiation therapy. plastic surgery: to assess the status of implants, and to diagnose complications after surgery. CT is contraindicated at any stage of pregnancy and can be used to survey pregnant women only for health reasons, even despite the fact that modern CT scanners have a minimum radiation exposure. If necessary, surveys of pregnant women, choose magnetic resonance imaging, it is safe for pregnant women. It is not recommended to CT (particularly contrast) and during breast-feeding. 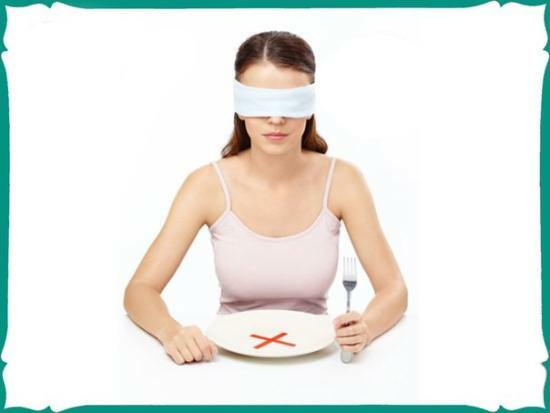 If the research is necessary, the woman is recommended to refuse feeding for a few days after the procedure. Contrast studies are also contraindication is an Allergy to iodine and other components of contrast agents, impaired renal function, thyroid disease, severe diabetes. It is technically impossible to perform a CT scan of a patient with significant obesity. In this case, limits the use of the device the size of the internal diameter of the gantry, the patient not only needs to fit in the unit, but stay in it in a free position. Unlike magnetic resonance imaging, computer can be used in severe claustrophobia and the presence of non-removable metal constructions outside the body, as well as implants and electronic devices inside a woman’s body. The advantages of using CT or MRI in pediatric practice – a question debatable, because CT involves radiation exposure and MRI in small children requires anesthesia and lasts much longer. Choosing between these two methods for the examination of the child, it is worth remembering that radiation exposure when using a modern CT scanner is negligible, comparable to conventional x-rays and will not harm the child during a single use. How to prepare for the CT? As a breast examination by CT is performed with contrast, it is necessary to refrain from eating for five hours. Body and clothing should not be metal elements visible in the film, dimming the areas of the body, difficult to diagnose. If the diagnosis of breast diseases already performed other studies, the results need to take with you. The other training study is not required.